Every year at the AFL Draft throws up some surprises to draft obsessives and casual fans alike. Each year, some fancied young players slip through the cracks to later picks, while others get reached for by clubs earlier than popularly anticipated. Now that the dust is settled, the first glances at the shocks and surprises can be taken – at the players who exceeded the draft expectations of expert opinion prior to the selection period, and those who were left in the cold. Here, HPN will look at player expectation by looking at each player’s consensus pre-draft rank, as discussed the final Consensus Phantom Draft of 2018, compared to their actual draft position. 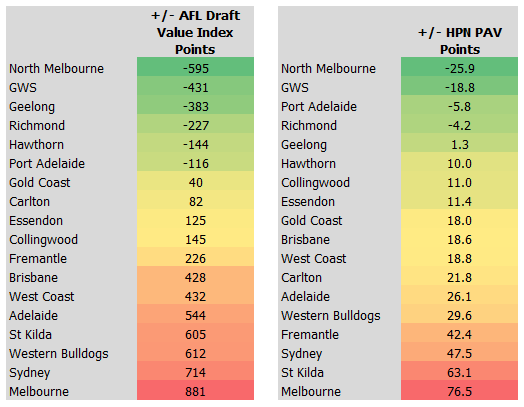 The movement against those rankings to the actual draft into the AFL’s Draft Value Index points system and the HPN pick value chart derived using Player Approximate Value. Around draft time, plenty of terms are chucked around for how players and clubs perform – whether they have reached for a player, or settle for one that has slid through the draft order. The important thing to bear in mind is that the only measuring stick here is expert (and often non-expert) opinion. It’s not always infallible. Clubs won’t necessarily see themselves as “reaching”, of course, and even if they do, they probably won’t admit it. Within the first round, the highest picks went pretty much as expected. Connor Rozee and Ben King were a virtual tie at 5th and 6th, and ended up flipping from the consensus view. As HPN outlined in the final CPD post, the Dogs were faced with the option of trading down to draft Bailey Smith (and to gain future picks along the way). In the end, they decided the risk of missing out on Smith was too great, and Smith went to the Dogs without a trade-down. Allegedly, noise came from the interstate clubs immediately below the Dogs that they were willing to trade with clubs like Richmond with Smith in mind, and the Dogs took the simple path to get Smith into the red, white and blue. Tarryn Thomas and Chayce Jones, the two Tasmanians, both went a little higher than expected. North were required to match pick 8 for Thomas, slightly ahead of the consensus view of 10th (or 12th if you took the most common selection). Chayce Jones had been linked to Adelaide, but generally not until their second selection. On the flip side, both Jordan Clark (pick 15 for Geelong) and Riley Collier-Dawkins (number 20 for Richmond) fell several picks past the two GWS selections at 11 and 14, despite the pretty strong consensus for the Giants taking both. GWS’ insightful “inside draft night” video suggests Caldwell was their Plan A, but a lot of the experts thought he’d be off the table by Adelaide’s selection. As we discussed in our live blog, five players who had been invited to the opening night on the expectation that they’d be drafted were left on the table overnight. Those were Ian Hill (consensus ranked 17th), Luke Valente (22nd), Curtis Taylor (23rd), Kieren Briggs (26th) and Will Kelly (30th). Instead, Xavier O’Halloran (27th ranked) was taken with the last pick of the night and Gold Coast traded to West Coast’s pick 23 for Jez McLennan (consensus ranked 28th) for the first pick of day 2. Those players fell as apparent bargains later on. GWS nabbed Hill at 24, Luke Valente (Champion Data’s 10th best player) slipped to Freo at pick 32 and Curtis Taylor all the way into the third round, heading to North at pick 46. A common theme for father-son and academy selections was that, beyond the first round, they slid past expectations. In the first round, Thomas and Quaynor were bid early, but beyond these two only Will Kelly was bid where the consensus rated him (at pick 29). Rhylee West and Jarrod Cameron were close to the consensus mark, but Bailey Scott, Connor McFadyen and Kieren Briggs attracted cheap bids well past their expected slots. That’s better than was offered for the group of Toby Bedford, Oscar Brownless, Caleb Graham, Ben Silvagni and Aru Bosenavulagi – who were not bid on at all and fell to their linked club’s final picks, in the 60s and 70s. Of these players, Bedford was perhaps the most glaring omission, as he was generally anticipated to be taken in the late 2nd round. The only exceptions to this trend of late round slip and slide were two unmatched bids for academy players. Irving Mosquito (at pick 38) was not matched by Hawthorn 13 places before the consensus rated him, while Matthew Walker (a GWS academy player) was taken by the Hawks at pick 63 without a single phantom drafter having him being selected at all. For GWS, it may have been expected that Walker might have slid to the Rookie Draft, and the Hawks capitalised on the Giants running out of picks. The first absolute bolter of the draft was James Rowbottom, who was taken at pick 25 by the Swans. He was rated somewhere around 42nd in the draft cohort by the experts, suggesting the Swans could have left him on the table and tried to get him later on. A similar story applies to Xavier O’Neill for West Coast, who was only identified by Chris Doerre at pick 55 and the Reddit community phantom at 66. The big reachers were the Demons, who did it twice. Tom Sparrow at pick 27 was rated around 45th, and James Jordan at pick 33. Jordon was a completely unforseen selection, pulled out of phantom draft obscurity by Melbourne (who have a habit of plucking kids based on private school form rather than TAC Cup form). Jordan closed the season strong for Oakleigh, but only managed seven TAC Cup games all year after getting called up midseason – his number was 64 for the Chargers. This isn’t to suggest those players are bad selections. It equally points to the limits of phantom drafting, as it shows how the cohort of the AFL’s foremost club-external draft experts had no idea who Sydney, West Coast and Melbourne may have actually been targeting with their picks. If the writers and observers did have some intel on these selections, they might have named these players higher and then they wouldn’t look like complete reaches by the clubs in question. The summary of the final positions of each club after the washup of the draft are shown here, using both valuation methods. On either measure, North’s haul was the biggest discount on expectations, with Taylor and Scott in the 40s when they were rated 23 and 32 overall. GWS’s value came via Jye Caldwell, Ian Hill, and Kieren Briggs all slipping down the order. At the other end, every Demons pick was a reach except the surprisingly cheap pickup of Bedford. Tom Sparrow and James Jordan were mentioned above as bolters earlier, but in addition nobody among the experts saw anyone picking up Marty Hore (pick 56) either, while almost nobody saw Aaron Nietschke (pick 53) being drafted. For the Swans, in addition to the aforementioned Rowbottom, at pick 44 they drafted Justin McInerney out of nowhere as far as the phantom drafters were concerned. Where the Dees and Swans both plucked unheralded youth, there was also a notable tendency for the expert phantom drafts to miss mature age state league draftees. 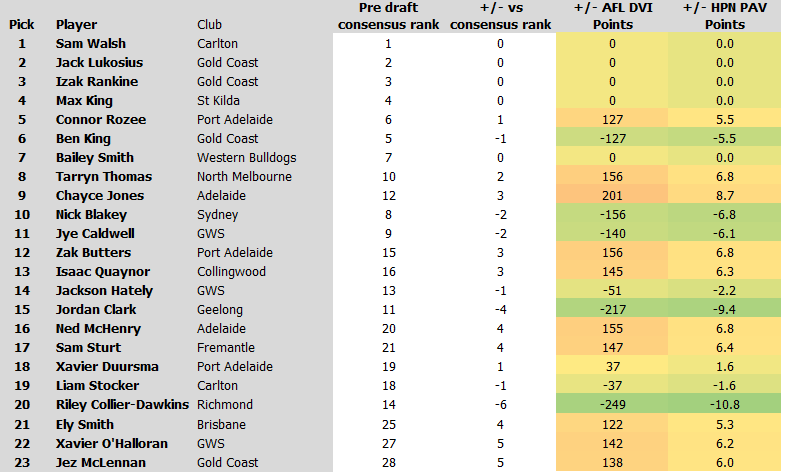 This led to both St Kilda and the Bulldogs being rated as having paid a lot for their picks relative to expert expectations in the chart above. St Kilda took Matthew Parker from South Freo at 47, Nick Hind at from Essendon VFL at 54 and Robert Young at from North Adelaide at 67. The Bulldogs grabbed Ben Cavarra from Williamstown at 45 and Will Hayes from their own reserves at 78. These older players, and others such as Lachlan Shultz and Brett Bewley from Williamstown to Fremantle, were all more or less completely missed by the Consensus Phantom Draft cohort. This is perhaps unsurprising, given those who take a specific focus in covering underage talent development mostly watch under-18s comps and don’t spend so much time watching or comparing to the state leagues. Sydney Stack was the only player rated in the first two rounds of the Consensus Phantom Draft to fall past not only the National Draft but the Rookie Draft as well. The next highest rated player to miss completely was Charlie Sprague, the consensus 46th ranked player, identified in three phantom drafts around picks 41 to 50. Marlion Pickett, the consensus 55th player, was also undrafted as a 26 year old who returned to football after some off field issues in years gone by. 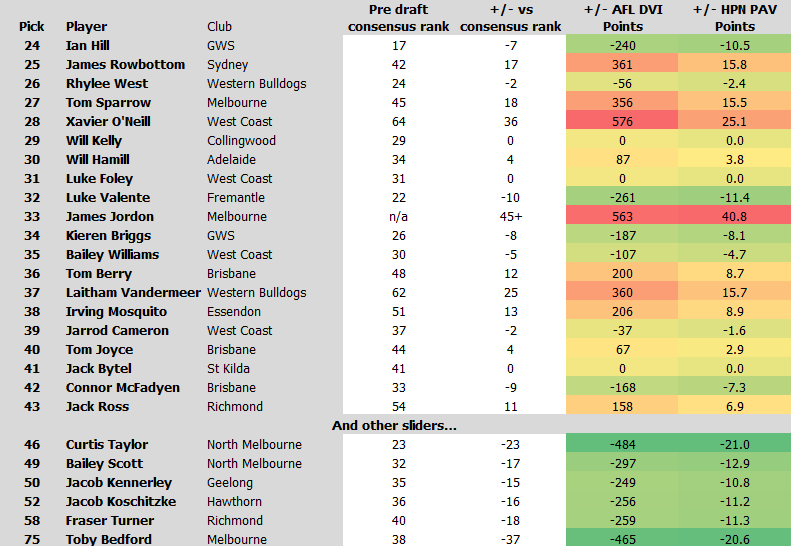 If Richmond sign Stack as a supplemental player, that’ll add 37 PAV and 465 DVI points to their balance, making them probably the most successful bargain hunters of the draft this year. There’s currently no news linking either Sprague or Pickett to a club.